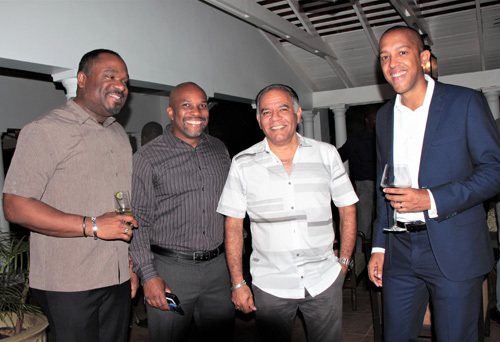 Anthony Pearson (second right), operator of the family owned Lloyd’s Department Store in Montego Bay, is in the company of the National Commercial Bank (NCB’s) senior executives (from left) Winston Lawson, Herbert Hall and Andrew Simpson at NCB’s recent hosting of the Monday Club. The island’s largest and most profitable financial conglomerate – the National Commercial Bank (NCB), with its imprint in parts of the Caribbean, is currently on a massive expansion as it seeks to invest in new and existing projects. Winston Lawson, Assistant General Manager for corporate banking with responsibility for western Jamaica and potential projects in the Caribbean, said NCB is very likely to participate in or lead in the financing of any major projects in Jamaica and the region that requires funding. He made the disclosure during an interview. Lawson also has oversight for the north and south coast regions. Lawson asserted that with western Jamaica being predominantly dominated by the hospitality sector, a great deal of emphasis would be placed on increasing NCB’s investment potential in these regions as he seeks to broaden NCB’s reach in the west and throughout the region. “The Caribbean is a tourism destination, so NCB is very upbeat and aggressive to extend our financial capabilities to investors undertaking any size projects. We have invested in several projects locally and regionally, with other projects in the making. We have the capacity and we are looking for more projects in which we can invest,” Lawson affirmed. Lawson was among a team of senior managers attending NCB’s annual hosting of the Monday Club, held in Rose Hall, Montego Bay, recently. The Monday Club is a professional all-males social event that is held monthly across Montego Bay and is sponsored by corporate entities. Head of corporate banking at NCB, Andrew Simpson, said NCB has recently repositioned itself with corporate investment portfolios across 13 countries in the Caribbean and Latin America. This strategy has given the Group the ability to extend its suite of products and services to a wider customer base, while diversifying revenue streams and allowing it to serve the existing customers in territories outside of Jamaica. “Our agility permits very efficient decision making and our flexibility ensures that product offerings are matching market requirements across the Caribbean and Latin America.” Simpson added. Lawson said NCB has the financial capacity to invest in multi-national projects across a gamut of industries, such as tourism, energy, manufacturing, distribution, logistics, construction, among other areas locally and regionally. “Jamaica is at a point where business and investor confidence is moving in the right direction, which means Jamaica is ripe for viable investments and NCB is well positioned to finance them. We are ensuring that we make ourselves available to provide the funding and the expertise where necessary,” said Lawson. The NCB Group has financial interests in St. Lucia, the Cayman Islands, Barbados, Antigua, Haiti, Costa Rica, The ABC Islands among other territories in the region.